North Atlantic Books, 9781556436086, 496pp. The bundled CD-ROM integrates these resources with a simple, graphics-based user interface incorporating the latest research. Please note that the CD is only intended for use on Windows 2000, ME, and XP. Dennis K. Chernin, MD, MPH, is a medical doctor, a homeopath, and the medical director of two county public health departments in Michigan. 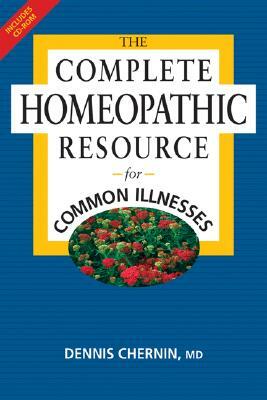 He has practiced homeopathic medicine since 1976. Currently, Dr. Chernin practices holistic and family medicine in Ann Arbor, Michigan, where he uses homeopathy as well as nutritional and meditational approaches to health care. He often lectures at the University of Michigan Medical School. Dr. Chernin received his BA and the Phi Beta Kappa honorary from Northwestern University and his MD and MPH from the University of Michigan. He did residencies in psychiatry and preventive medicine and is board certified in preventive medicine. His three other published books include Health: A Holistic Approach; Homeopathic Remedies for Health Professionals and Laypeople; and How to Meditate Using Chakras, Mantras, and Breath (with audio CDs).
" Dr. Chernin is one of the preeminent clinical homeopaths practicing in the United States today. Under his tutelage I have witnessed miraculous results with this modality of medicine." "The Complete Homeopathic Resource is a user-friendly source of information for health and medical professionals as well as the general public. Now that research is encouraging physicians to reduce prescriptions for antibiotics and pain-killing drugs, homeopathic medicines have an increasingly important role in health care.”." "Hurray for Dr. Chernin and this new book and CD! The history is fascinating. The scope is comprehensive. The material is everyday practical and to the point. This book is a great help to me regularly and I place it on my desk ready for the next patient."